I have what could be described as a slight obsession with pocket knives. I have carried one, whenever possible, since my thirteenth birthday. In that time I have had quite a few and about the only thing they all have in common is that they are usually razor sharp. From traditional to modern, production to custom, I have sampled the gamut. Columbia River Knife & Tool (CRKT) has enlisted the talents of two men that stand at opposite ends of the style spectrum in folding knives. The “father of the modern folding knife” Ron Lake, creates traditional designs with durable materials and revolutionary innovations. In contrast, Ed Halligan has created arguably the most successful designs in modern knife making. The Lake 111 Aluminum is a cutting tool ready for a lifetime of hard work. I tested the satin finished 3.125” combination Razor-Sharp and Triple-Point™ Serrated blade, wrapped in brass liners and black anodized aluminum handles. Lake’s Lock Back Safety (L.B.S.™) ensures your digits will all remain intact, even during the most strenuous tasks. This knife represents what I consider the foundation of lock back folders and is built to be used and abused. Ed Halligan, maker of the legendary K.I.S.S. money clip knife, gives us the H.U.G. (Halligan’s Ultimate Gadget). This modern, skeletal design provides style and function well beyond its smaller stature. With a 2.3” modified spear point blade and single sided frame with integrated lock, this a great every day carry knife. I have it in my pocket right now, as a matter of fact. Available in both a razor or combination edge, this folder handles daily tasks with ease. By working with a team of knife making legends (over 30 designers in all) CRKT has put together a line-up of knives that can satisfy every taste for every task. 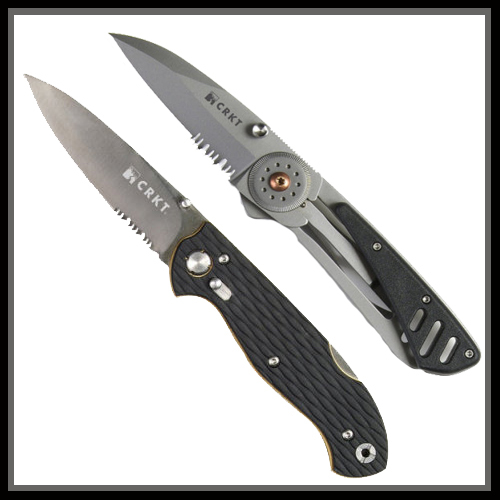 If you are in the market for a new blade, CRKT has what you are looking for at a price you can handle.